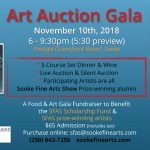 ~The Sooke Fine Arts Society (SFAS) Fine Art Auction & Gala Fundraiser invites guests to enjoy a professionally-conducted live art auction, a visually stunning silent auction, and an elegant three-course meal at the beautiful Prestige Oceanfront Resort Ballroom. SFAS has partnered with the West Coast Grill to bring you an exciting evening of delicious food and award-winning art. The event is in support of the SFAS Youth Art Scholarship Fund & the Sooke Food Bank. Tickets are $65/person and includes a 3-course meal & wine. Guests are encouraged to pre-register by calling the SFAS office: 250-642-7256.